Agreed. The image quality on this is way better than any smartphone I've ever used, and i it weighs less than 100g - No issue carrying it around. The only bit of advice I'd offer to anyone that purchases this camera is to drop the resolution down to 10mp - 14mp shots tend to be noisy (noticeable when performing heavy cropping), even at lower ISO. Leica lens for 55 quid; bargain. New black ones on ebay for £50. Hot for the price, the weight and the zoom lens. 100g is about right for the pocket / handbag. 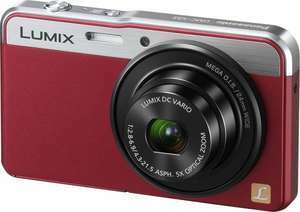 How does this compare to the lumix at £39 from tesco direct? Agreed. The image quality on this is way better than any smartphone I've … Agreed. The image quality on this is way better than any smartphone I've ever used, and i it weighs less than 100g - No issue carrying it around.The only bit of advice I'd offer to anyone that purchases this camera is to drop the resolution down to 10mp - 14mp shots tend to be noisy (noticeable when performing heavy cropping), even at lower ISO. does using 10MP actually decrease the noise and its not a full res one internally resized? thought that there needed to be some sort of special configuration such as in fuji exr cameras to group areas of the sensor array? Leica (branded) lens may be a bit better? I suspect there's not much in it for the additional £15. does using 10MP actually decrease the noise and its not a full res one … does using 10MP actually decrease the noise and its not a full res one internally resized?thought that there needed to be some sort of special configuration such as in fuji exr cameras to group areas of the sensor array? Haven't got the foggiest, I'm afraid. Anecdotal evidence from someone that uses a £50 camera to take snaps. . .
My point was more around the gulf in class that still exists between a top-end smartphone and a cheap-as-chips compact. My wife has a 5S and I have a G2, and this produces superior shots using just about every measure I can think of..
My point was more around the gulf in class that still exists between a … My point was more around the gulf in class that still exists between a top-end smartphone and a cheap-as-chips compact. My wife has a 5S and I have a G2, and this produces superior shots using just about every measure I can think of..
Where does it say this has a Leica lens ? It doesn't have a Leica lens, it's a standard Panasonic lens, also it uses the fiddly micro-sd cards. It doesn't have a Leica lens, it's a standard Panasonic lens, also it … It doesn't have a Leica lens, it's a standard Panasonic lens, also it uses the fiddly micro-sd cards. Yes, that's what I thought it's a standard Panasonic lens not a Leica. Don't understand why some posters are saying otherwise.